The Slovak National Theatre is loved for its art performances including Plays, Opera and Ballet which are a crowd-puller in Bratislava. The theater is the oldest professional theater in the city and still functions as one of its cultural and art highlights. The theater is known for its royal interiors and classy performances with state-of-the-art acoustical design. If you are fan of Opera or Ballet, do catch a live performance here while sitting amidst a little piece of history itself. Having witnessed some remarkable performances through its genesis the Slovak National Theatre is the place of worship of theater artists and performers. 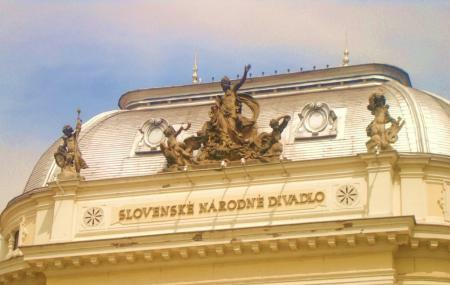 Slovak National Theatre Tickets are usually sold out on days of performances. Tickets for Slovak National Theatre can be availed at great discounts on our tickets section. While Slovak National Theatre ticket prices are subject to change as per performance schedules, you can always buy tickets for Slovak National Theatre directly from their website or ours. This way you don’t lose the chance of tickets being sold out as well. Visit the official website for show prices or call up the place. How popular is Slovak National Theatre? People normally club together Jesuit Church and Slovak Philharmonic while planning their visit to Slovak National Theatre. Very nice place with awesome stage but in dressing room for staff was litle bit hot. Love this place! Each performance is a unique experience. Lovely theatre with spectacular performances. I love to coming here every now and then. Absolutely can recommend to anyone.